It is thought that in 1956, in order to perpetuate the memory of the outstanding risks and sacrifices made on behalf of the RAF and Allied aircrew and also to foster the spirit engendered by those events, the Royal Air Forces Escaping Society presented the Royal Air Force with a silver trophy. 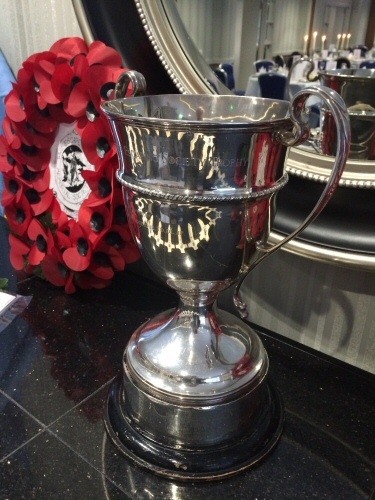 The RAFES Silver Trophy was presented annually for the best individual feat of combat survival or comparable feat of challenge and achievement carried out by a member of the RAF during operations or recognised training. in 1983 the Trophy was awarded to Sqn Ldr Bob Iveson who was shot down in the Falklands War and evaded capture for 60 hours. in 1989 it was awarded to F/S Dodsworth, winchman in the duty Air Sea Rescue helicopter crew at RAF Brawdy for his part in the rescue of the crew of the stricken freighter Secil Japan in St Ives Bay. In 1991 the RAF took charge of the RAFES Trophy and in 1995 the Society closed down. Many former members of RAFES joined the Escape Lines Memorial Society (ELMS). Over the years the fate of the RAFES Trophy appeared to be difficult to determine amidst the frequent changes taking place in the RAF. In 2014 the 'long lost' Trophy was finally located and is now in the possession of ELMS. It was on display at the ELMS Reunion Event in York in April 2015. This has been a long drawn out search, dating back to 2003. The late Sir Lewis Hodges, Elizabeth Harrison (the last President and Secretary respectively of RAFES) and Roger Stanton of ELMS were all involved in tracking it down. "we thought we had found it a number of times but it kept slipping through the net. The Trophy was finally located following a call to me from ELMS member Frank Haslam, who runs a very good website on the RAFES, who had received an email from 22 Squadron indicating that they had a RAFES Trophy and that they were disbanding." This was immediately followed up but the trail was convoluted. 22 Squadron was a Search and Rescue helicopter squadron, made up of detachments at different bases around the UK and headquartered at RAF Valley. 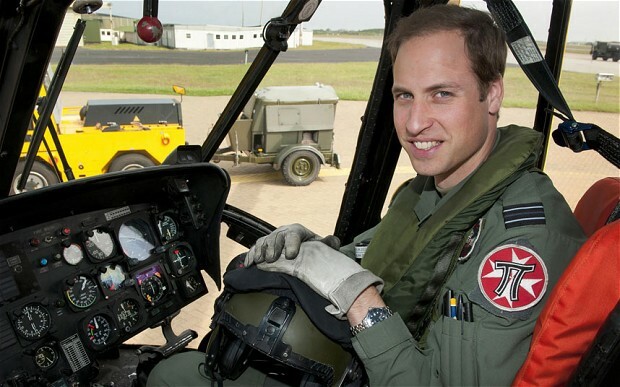 This is the SAR unit that Prince William served on - he is seen here wearing the distinctive 'pi' 22 Squadron badge on his flying overalls. 22 Squadron's SAR role is being taken over by Bristow Helicopters at the end of 2015. Due to the squadron's operational activities and the nature of the admin structure during the privatisation process, continuity of contact was difficult and the Trophy continued to evade location. Approaches were made to all of the squadron's bases, but as explained they had more pressing matters on their minds. Roger finally made contact with the person who had contacted Frank Haslam. Fortunately they were involved with the disposal/return of the squadron's silver. That was not the end of the story; researches, identification, high-level decisions, paperwork and protocols took many more weeks. To cut a long story short, the RAFES Trophy has now been taken provisionally on to the ELMS Property Book with a view to resurrecting the award of it according to to the wishes of former members of the RAFES Committee, subject to consideration by the ELMS Trustees. The matter was discussed further at the ELMS AGM in April 2015. They had been sent out 250 miles west of the UK to a sinking ship called Sonja Nancy. The aircraft had been stripped out to carry maximum fuel, and they had to winch 13 of the ship's crew to rescue them. The weather was at the limits of the Sea King's ability, and it was night. The conditions were so severe that at the time it was suggested they return to land and wait for daylight, however they knew if they did that, then there would be no one left to rescue. The aircraft had 50 minutes of fuel on scene, and after 35 minutes they had only managed to rescue one crewmember. 5 'Hi-lines' were broken (they attached the ship to the aircraft's winch hook to transfer casualties) in the process, however the radar operator had thought to grab a few extra ones before takeoff. The successfully rescued all 13 crew members and returned to land safely. Left: the Trophy on display at ELMS 2015. The size can be judged by the ELMS poppy wreath next to it. Poignantly, the tropy reflects ELMS Crosses that were laid out in rows in front of it. 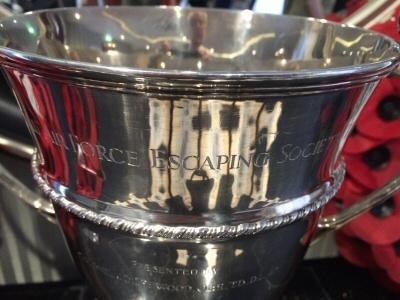 Above: The title of the Trophy, showing that it is the Royal Air Force singular, not plural as it should have been for RAFES? Indications are that it may have been presented in 1956. The silver band on which the names of winners are inscribed is completely full. Many of the Squadrons have now taken on a Special Forces role. Citations for the award are understood to be now now lodged in the IWM RAFES files. Research is continuing on the possibility that the Trophy was awarded in 2002.